I am late to the Jesca Hoop party. Anna Maria mentioned Jessica (she was Jessica, then changed to Jesca) Hoop in her top albums of the year in 2007. So I knew OF her, but I had not listened to the music yet. Being time challenged as I sometimes am, it took me awhile to check her out. I recently downloaded her album, Kismet from e-music and I can’t stop listening to it. It’s been like 4 weeks. I take it out of the car stereo for two seconds then put it back in. It’s like a sickness. If you aren’t familiar with her here are some tidbits: she’s English (no she’s not, see comments). Her music sometimes reminds me of Sarah Slean, sometimes like Lily Allen. I’d call it very quirky pop. Intelligentactile 101: They don’t get much peppier, poppier than this. It’s a fun one to sing along with once you know what she’s saying. Havoc in Heaven: Weird, cool, notes and rhythms along with odd phrasing makes this one of my favorites. Out the Back Door: This one makes me want to dance. And I don’t dance. Wow, I just realized she’s on Nettwerk (Sarah McLahlan’s label) I thought she was indie. Oh well, good label, good artist. It would have made it onto my best of list had I heard it when it was released. Hell, it just might make it on my 2009 list anyway. I make the rules, I can break ’em if I want to. Jesca is very cool indeed. 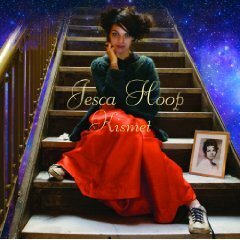 Jesca Hoop is English? I thought she was from Cali…only recently did she move to Manchester.